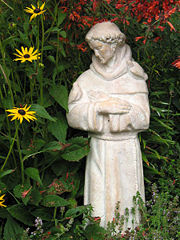 Saint Francis of Assisi (1182 – October 4, 1226) is for many people the most Christ-like Christian of all ages. For many, he is an iconic, inspirational figure whose life mirrors that of Jesus of Nazareth more closely than any other figure in Christian history. His love of nature, his renunciation of wealth, his simple lifestyle, his deep spirituality that resulted in the experience of the Stigmata (bodily marks or sensations of pain in locations corresponding to the crucifixion wounds of Jesus), his desire to spread the Gospel peacefully at a time when the Crusades identified the Church with violence, all mark him out as an exemplary figure. 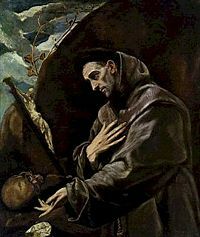 Francis founded the Franciscan Order or "Friars Minor" (the first order), the Poor Clares (founded on his advice by his friend, Saint Clare) for women (the second order), and the Third Order for lay-people who remain in secular life. He is the patron saint of animals, merchants, Italy, Catholic action, and the natural environment. Many of Saint Francis's ideas resonate with modern sensibilities. He is especially popular amongst peace and environmental activists. He respected nature and regarded all creatures as his brothers and sisters. He believed in the universal brotherhood of all people, women and men. He treated women equally with men, was aware of the feminine aspects of his own personality, and saw God as Mother and as Father. He realized the dangers of a church that was too worldly, and tried to reform it. Saint Francis forbade members of the Third Order from bearing arms. He did not oppose war outright, but taught that nonviolence is the higher way. He visited the Holy Land and witnessed the Christian message to the Sultan of Egypt. Like Jesus, he attracted crowds when he preached and he spent a great deal of time with the poor and sick, especially lepers. His legacy lives on in the orders he founded, in songs and poetry. Most of all, he became a role model for Christians from that time forth who regarded imitation of Christ rather than devotion to Christ as the truest form of religion. Although he was loyal to the Church, his sense of direct communion with God was so powerful that what he taught as God’s will was not always consistent with the teaching of the church. His charismatic and unpredictable leadership created a tension with the Church that was partly resolved by giving him control of an order which he headed outside the regular ranks of the priesthood. He continuously proclaimed himself to be imperfect, setting a standard of poverty that was so high his friars struggled to maintain it. Saint Francis was born Giovanni di Bernardone, but was commonly known as Francesco (Francis), meaning in Italian, "Little Frenchman." This pet name was chosen by his father, Pietro, a wealthy cloth merchant, after the death of his mother, Pica—she having been of French origin. Francis was one of several children. Rebellious toward his father's business and pursuit of wealth, Francis would spend most of his youth lost in books. Ironically, his father's wealth afforded his son an excellent education, and he became fluent in reading several languages including Latin. Francis was also known to drink and enjoy the company of his many friends, who were usually the sons of nobles. His displays of disillusionment toward the world that surrounded him became evident fairly early, one of which is shown in the story of the beggar. In this account, Francis was having fun with his friends one day when a beggar came along and asked for alms. While his friends ignored the beggar's cries, Francis gave the man everything he had in his pockets. His friends quickly chided and mocked him for his stupidity, and when he got home, his father scolded him in a rage. In 1201, Francis joined a military expedition against Perugia, was taken prisoner at Collestrana, and spent a year as a captive. It is probable that his conversion to more serious thoughts was a gradual process relating to this experience. After his return to Assisi in 1203, Francis recommenced his carefree life. But in 1204 a serious illness started a spiritual crisis. In 1205 Francis left for Puglia to enlist in the army of Gualtiero di Brienne. But on his way, in Spoleto, a strange dream induced his return to Assisi, and deepened his spiritual crisis. Francis started to avoid the parties and feasts of his former friends because his heart was no longer with them. When they asked him if he was thinking of marrying, he answered "Yes, a fairer bride than any of you have ever seen"—meaning his "lady poverty," as he afterward used to say. He spent much time in lonely places, asking God for enlightenment. Gradually he took to nursing lepers, the most repulsive victims in the lazar houses near Assisi. After a pilgrimage to Rome, where he begged at the church doors for the poor, having first exchanged his clothes for theirs, he had a mystical experience in the Church of St. Damian just outside of Assisi. The Icon of Christ Crucified came alive and said to him 3 times, “Francis, Francis, go and repair my house which, as you can see, is falling into ruins.” He thought this to mean the very ruined church in which he was presently praying, and so sold his horse together with some cloth from his father's store, to assist the priest there for this purpose. Pietro, highly indignant, attempted to bring Francis to his senses, first with threats and then with corporal chastisement. After a final interview in the presence of the bishop, Francis renounced his father and his patrimony, laying aside even the garments he had received from him. For the next few months he lived as a beggar in the region of Assisi. Returning to the town where he spent two years this time, he restored several ruined churches, among them the Porziuncola, little chapel of St. Mary of the Angels, just outside the town, which later became his favorite abode. At the end of this period (according to Jordanus, on February 24, 1209), Francis heard a sermon on the Gospel of Matthew 10:9 that changed his life. In this gospel, Christ tells his followers that they should go forth and proclaim that the Kingdom of Heaven is upon them, and that they should take no money with them, that they should take no walking stick for the road, and that they should wear no shoes. This made such an impression on Francis that he decided to devote himself wholly to a life of apostolic poverty. Clad in a rough garment, barefoot, and after the Evangelical precept, without staff or scrip, Francis began to preach repentance. He was soon joined by his first follower, a prominent fellow townsman, the jurist Bernardo di Quintavalle, who contributed all that he had to the work. Many other companions joined Francis, and reached the number of eleven within a year. In his humility, Francis chose never to be ordained a priest, and the community lived as "fratres minors," in Latin, lesser brothers. The Franciscans are sometimes called Friars Minor, a term derived from "fraters," in Latin, brothers. The brothers lived a simple life in the deserted lazar house of Rivo Torto near Assisi, but they spent much of their time wandering through the mountainous districts of Umbria, always cheerful and full of songs, yet making a deep impression on their hearers by their earnest exhortations. In 1209 Francis led his first eleven followers to Rome and asked the Pope's permission to found a new religious order and succeeded in gaining the approval of Pope Innocent III. 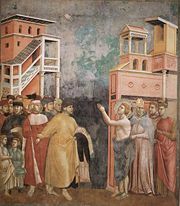 At first his attempt to speak with the Pope was refused; but the following night, Innocent III saw in a dream the church was crumbling apart and a poor man appearing to hold it up. The next morning, recalling the poor man he had refused the day before, he recognized him as the man he saw in his dream, and decided to change his verdict the following day. From then on, Francis’s new order grew quickly with new vocations. When hearing Francis preaching in the church of San Rufino in Assisi in 1209, Clare of Assisi became deeply touched by his message. On Palm Sunday, March 28, 1211 Francis founded the Second Order, known as the Poor Clares, for her and other sisters who also joined. Her brother Rufino also joined the new order. In the same year, Francis left for Jerusalem, which he had long wanted to visit. Regrettably, he was shipwrecked by a storm on the Dalmatian coast, forcing him to return to Italy. On May 8, 1213 Francis received the mountain of Verna as a gift from the count Orlando di Chiusi. This mountain would become one of his favorite retreats for prayer. In the same year, Francis sailed for Morocco, but this time an illness forced him to break off his journey in Spain. Back in Assisi, several nobleman (among them Tommaso da Celano, who would later write the biography of Saint Francis) and some well-educated men joined his order. In 1215 Francis went again to Rome for the Fourth Lateran Council. During this time, he probably met Saint Dominic de Guzman (d. 1221), who also founded an order of friars, the Friar Preachers or Dominicans. In 1216 Francis received from the new pope Honorius III the confirmation of the indulgence of the Porziuncola, now better known as the Pardon of Assisi, which was a complete remission of their sins for all those who prayed in the Porziuncola. In 1217 the growing congregation of friars was divided in provinces and groups were sent to France, Germany, Hungary, Spain, and to the East. Spiritually they can behave among other people in two ways. One way is not to make disputes and controversies, but to be subject to every human creature for God's sake, and to witness that they are Christians. The other way is, when they see that God pleases, to preach the word of God. In September 1220, receiving a report of the martyrdom of five brothers in Morocco, Francis returned to Italy via Venice. Cardinal Ugolino di Conti was then nominated by the pope as the protector of the order. When problems arose in the order, a detailed rule became necessary. On September 29, 1220 Francis effectively retired or resigned as minister-general, retaining the title but handing over the governance of the order to brother Pietro Cattini as his Vicar at the Porziuncola. As he stepped aside, Francis said, “Lord, I give Thee back this family which Thou have didst entrust to me. Thou knowest, sweet Jesus, that I have no more the power to take care of it. I entrust it, therefore, to the ministers….” The exact reasons for Francis resignation are unclear. It appears to have had something to do with the difference between his vision for the order and its practical working out among ordinary men, probably centering on the poverty issue. Soon afterwards however, brother Cattini died on March 10, 1221. He was buried in the Porziuncola. Reportedly, miracles started to occur and people flocked to the Porziuncola, disturbing the daily life of the Franciscans. Francis begged Cattini to stop the miracles and to obey him in death as he had obeyed him during his life. From that moment the miracles ceased. 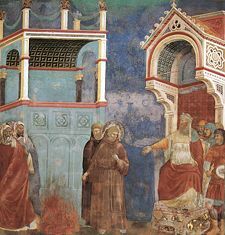 Saint Francis receives the Stigmata (fresco attributed to Giotto). That same year, Francis was ordained as a deacon, which allowed him to read parts of the liturgy but not to celebrate Mass. The Church never quite approved of Francis’s radical view of poverty. Although he remained obedient to the Church, the Church was a little frightened by his charismatic spontaneity, his preaching in the open air, which they could not control. They feared that he might start to say the mass, “to interpret Christian doctrine in his own way, and preach wherever and whatever he wished,” although he was only as deacon, not a priest. The Franciscans themselves relaxed the rule on poverty and on property. They own land and run universities, but have never altogether departed from the original ideal. While he was praying on the mountain of Verna, together with his close friend Thomas, Francis received the Stigmata on September 17, 1223. Suddenly he saw a vision of an angel on a cross. This angel bore holes into St. Francis's feet, hands, and chest. This is the first account of Stigmata in history. However, no one knew about this occurrence until after his death, when Thomas told a crowd of Franciscans that he had witnessed this account. Suffering from these Stigmata and from an eye disease, he had been receiving care in several cities (Siena, Cortona, Nocera) to no avail. In the end, he was brought back to the Porziuncola. He was brought to the transito, the hut for infirm friars, next to the Porziuncola. Here, in the place where it all began, feeling the end approaching, he spent the last days of his life dictating his spiritual testament. He died on the evening of October 3, 1226. On July 16, 1228 he was pronounced a saint by the next pope Gregory IX, the former cardinal Ugolino di Conti, friend and protector of St. Francis. 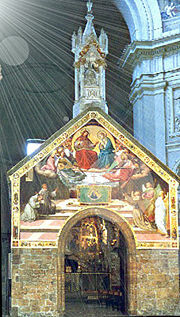 The next day, the pope laid the foundation stone for the Basilica of Saint Francis in Assisi. The Stigmata is a difficult phenomenon to understand, except perhaps in psychological terms as a physical reaction to Francis' inner striving to emulate Christ. Bonaventura actually suggested that Francis achieved an excellence in this life that seemed more than human. Perhaps his spiritual closeness to Jesus stimulated a complex reaction. Many of the stories that surround the life of Saint Francis deal with his love for animals. Then Francis led the wolf into the town, and surrounded by startled citizens he made a pact between them and the wolf. Because the wolf had “done evil out of hunger” the townsfolk were to feed the wolf regularly, and in return, the wolf would no longer prey upon them or their flocks. 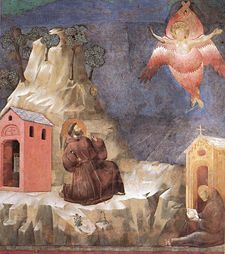 In this manner Gubbio was freed from the menace of the predator. Francis, ever the lover of animals, even makes a pact on behalf of the town dogs, that they will not bother the wolf again. These legends exemplify the Franciscan mode of charity and poverty as well as the saint's love of the natural world. Part of his appreciation of the environment is expressed in his Canticle of the Sun, a poem written in Umbrian Italian in perhaps 1224 which expresses a love and appreciation of Brother Sun, Sister Moon, Mother Earth, Brother Fire, etc. and all of God's creations personified in their fundamental forms. Francis’s legacy lives on through the Franciscans, who still serve the poor in many parts of the world. His legacy lives on through those who find inspiration to work for peace, or for environmental protection. Four Popes have been Franciscans. G. K. Chesterton (1957) says that Francis can be represented as having “anticipated all that is most liberal and sympathetic in the modern mood: the love of nature; the love of animals; the sense of social compassion; the sense of the spiritual dangers of prosperity and even of property …. he could be presented not only as a human but a humanitarian hero; indeed as the first hero of humanism.” We may chastise him for “his self-denial” and for “his chastity,” but what Francis represents above all is a systematic, disciplined emulation of Christ; “the adoration of Christ had been part of the man's passionate nature for a long time” but “the imitation of Christ, as a sort of plan or ordered scheme of life, may be said” to begin with Francis. ↑ Jonathan Riley-Smith, The Crusades (New Haven, CT: Yale University Press, 2005, ISBN 0300101287), xxxiii. ↑ Norman Daniel, Islam and the West: The Making of an Image (Oxford: Oneworld Publications, 2000, ISBN 1851681299), 136. ↑ 3.0 3.1 Daniel, 140. ↑ Adrian House and Karen Armstrong, Francis of Asissi: A Revolutionary Life (Marwah, NJ: The Paulist Press, 2003, ISBN 1587680270), 210. ↑ 6.0 6.1 Daniel, 222. ↑ Edward C. Butler, “Francis of Assisi,” Encyclopedia Britannica, vol. X, (NY: Encyclopedia Britannica, Inc., 1911), 938. ↑ 9.0 9.1 Butler, 2. ↑ G. K. Chesterton, Saint Francis of Assissi (NY: Doubleday, 1997, ISBN 0385029004), 96. ↑ House and Armstrong, 98. ↑ G. Oliger, Catholic Encyclopedia Rule of Saint Francis,New Advent, 1909, Retrieved June 25, 2007. ↑ 13.0 13.1 House and Armstrong, 99. ↑ House and Armstrong, 97. ↑ Karen Armstrong, A History of God (NY: Ballantine, 1993, ISBN 0345384563), 207. ↑ 17.0 17.1 Chesterton, 98. ↑ 19.0 19.1 St. Francis of Assisi, The Little Flowers of St. Francis of Assisi (New York: Vintage, 1998). ↑ 20.0 20.1 Robert F. Kennedy, Jr. and Dennis Nolan, Saint Francis: A Life of Joy (NY: Hyperion, 2005, ISBN 0786818751), 2. ↑ Kennedy and Nolan, 25. ↑ House and Armstrong, 293. ↑ Edward C. Butler, “Franciscans,” Encyclopedia Britannica, vol. XI, (NY: Encyclopedia Britannica, Inc., 1911), 2. Butler, Edward C. "Francis of Assisi" Encyclopedia Britannica, vol. X. NY: Encyclopedia Britannica, Inc., 1911. Butler, Edward C. "Franciscans." Encyclopedia Britannica, vol. XI. NY: Encyclopedia Britannica, Inc., 1911. Pope Gregory IX, Bulla "Mira circa nos" for the canonisation of St. Francis, July 19,1228. Fioretti di San Francesco, the "Little Flowers of St. Francis," end of the fourteenth century: an anonymous Italian version of the Actus; the most popular of the sources, but very late and therefore not the best authority by any means. History of "Francis of Assisi"
This page was last modified on 25 April 2017, at 14:39.